We are thrilled to have teamed up with top London Greek Chef, Theodore Kyriakou, who has created some fantastic recipes using our award winning Classic Greek Style Yogurts. 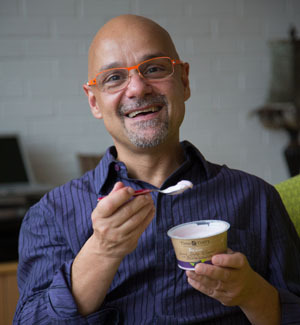 Athens born Theodore, best known for launching Livebait and The Real Greek restaurants in London, loves Greek food and wants to inspire us to use more Greek style yogurt in our day to day cooking and remind us what a fabulous ingredient it can be. As an award winning chef he relishes the traditions and great skill handed down to him by his father and grandfather. With his innate sense for Mediterranean flavours these new dishes are motivated by his love of herbs, the sun and the simple tastes of the land and the sea.